Dust Control Solutions Ltd have completed the supply and installation of 4 off De-Burring booths each booth 4 metres wide x 3 metres deep and 2.5 metres high, booths, the booths are double skinned, insulated with flush lighting providing a lux value greater 1000, all electrical fittings are also flush internally and rated IP66. Each booth has localised extraction via 2 off ATEX rated Nederman arms type NEX S Stainless Steel, also included is a centralised vacuum cleaning system for general housekeeping, this system is also ATEX rated. 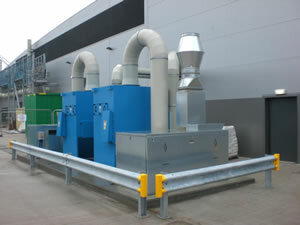 The dust handled on these systems was Titanium, the extracted dust is conveyed externally over 100 metres and collected at wet collectors each with a centrifugal fan mounted in acoustic enclosures in order to reduce the noise level under 69dBA. These systems designed and provided by Dust Control Solutions Ltd included all items of plant, booths, fans acoustic enclosures and wet collectors; we provided the booth lighting, all electrical wiring and was installed and commissioned by our own personnel.